Yesterday, I spent the morning at Panera Bread coffee shop. Actually it was from about 6:45 until 2:00 PM. It’s hard to “rent” a booth for so long – with just two cups of coffee, some yogurt and a bagel. Kim went to work, finishing up everything so she could take the rest of the week off. She was only going to be there for a few hours. Hah! I know how THAT goes. So… about eight hours later, she picked me up! In the meantime, I got to do lots and lots of writing. After she picked me up, she took me to her favorite pottery gallery, Cedar Creek Gallery. This is where her pottery boyfriends show their wares. She’s gone to events, where you can watch the potters at work, chat with them, and of course, buy their stuff. She calls them her boyfriends because they are so nice and so cute. Kim has a way of making friends, knowing everyone’s name, and becoming part of the place very quickly. She cares about every single person, and makes it a point to reach out. The woman at the bank, in the grocery store, in the gallery, etc. The gentleman in the parking lot when she came to pick me up. I watched her. Brief chat about something, and he gets into his car smiling and laughing. Just no w, we’re sitting in Whole Foods using their Wi-Fi so I can write this and Kim can read her book. 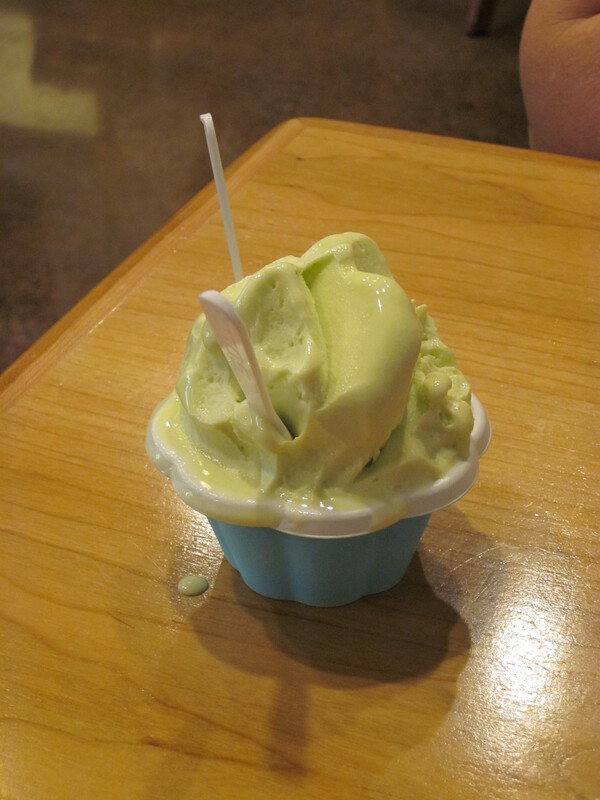 She gets up to get us some water, and comes back with this little cup of delicious Pineapple Basil Gelato and a story of the guy who had to give her a taste. It was so delicious that she had to order a small. So he took a small cup and kept piling it on. That’s plenty, she said. Hey! He said. You’re in MY house. Just take it. After the gallery, she took me to Bob’s Barbecue in Butner, NC. (Bernie Madoff is in prison in Butner.) That’s important. Now THIS is the SOUTH! Bob’s Barbecue is like a tribute to the seventies, only it doesn’t mean to be. It apparently has been run by the same family from day one, and it has never been remodeled or updated. 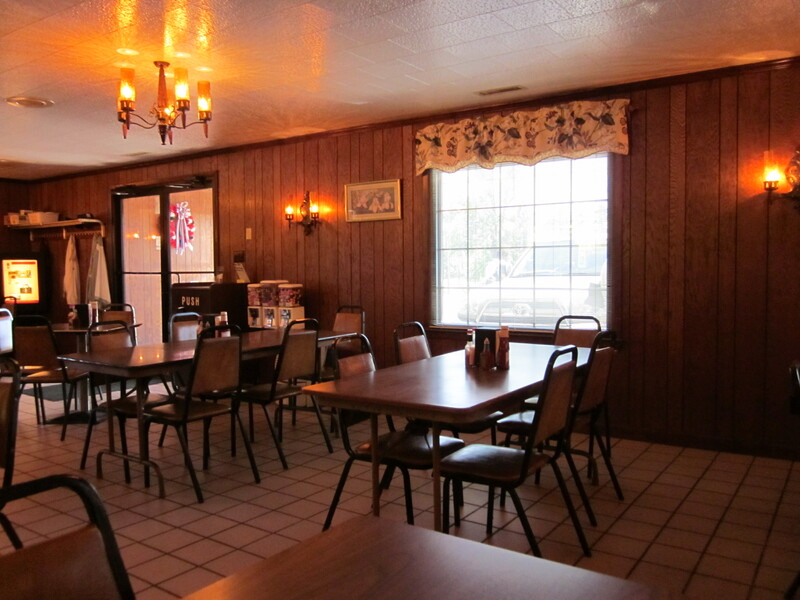 Check out the wood paneling and light fixtures. Kim had me order the barbecue plate. You get two vegetables with that. 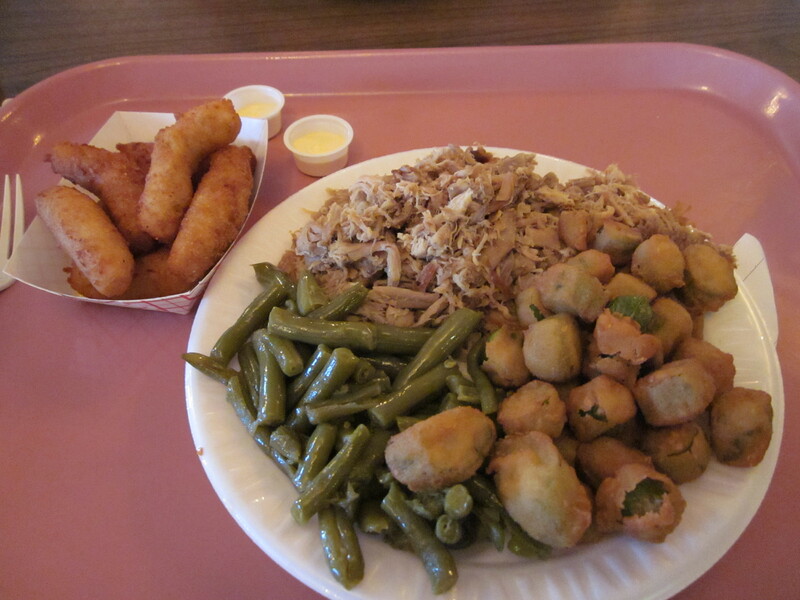 The vegetable menu consists of potato salad, French fries, fried okra, cooked apples, green beans, and cabbage. I chose fried okra and green beans. As a good Texan, my mom used to make fried okra for us, and I loved it. That’s the only way okra comes. 1/3 inch slices, coated in corn meal, and fried in oil. Kim got me a side of hush puppies to go with it. Check it out. Now, I’m in the South. Bob’s looks like the Lighthouse restaurant in Bayou le Batre, a fishing village in coastal (as in Gulf Coast) Alabama where we ate dinner Monday night…fried oysters, fried shrimp, fried grouper, fried crab legs, and even a fried stuffed soft shelled crab. Hush puppies too. Our veggies were baked potato, french fries, salad (iceberg lettuce of course), potato salad or coleslaw. Then we took a drive down to the water. Lovely evening. Ah… where would we be without lard? Kim says she heard that lard is making a come back. Somehow it’s better for you than they thought. Ha! How’s the water? Any black blobs floating around?